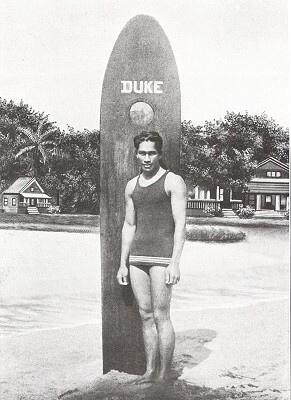 Aloha from Honolulu, circa 1912. The Island Curio Company, Honolulu, T. H., circa 1912. Subtitled, Views of Honolulu, a selection of black and white images from the Hawaiian islands, circa 1912. Unpaginated. WAIKIKI BEACH - Probably the most beautiful beach in all the world is to be seen at Waikiki. At all hours of the day bathers and surf riders can be seen in the surf. filled with laughing natives and tourists. indulged in at night as well as day. There is not the slightest danger from undertow or deep water. - The Champion Swimmer of the World. 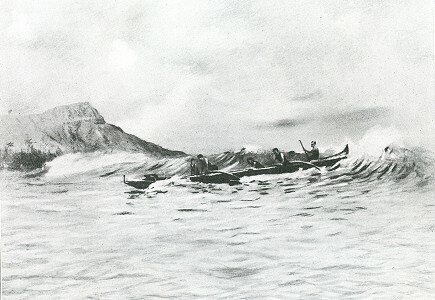 CANOEING - A very popular and thrilling experience riding on the big rollers as they come piling in onto the sandy beach at Waikiki. 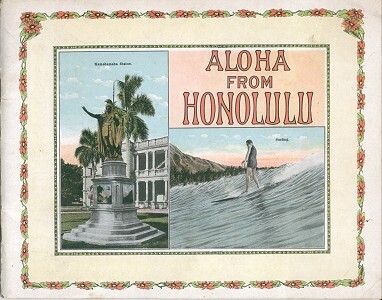 The Island Curio Company, Honolulu, T. H.
Geoff Cater (2011) : Island Curio Company : Aloha from Honolulu, 1912.